Morality regulates the person and the society properly. It injects values in life and enriches it. The seeds of the moral values are sown in the childhood. That is the reason perhaps that all the societies have rich treasures of the stories for children in literary or oral folklore form. In whatever form, the purpose of the stories invariably is to inculcate moral values in the characters of the listeners or readers. This book presents a prize collection of moral stories that parents and grandparents have been using to thrill and charm the children for centuries. These stories were bred and nurtured by different cultures. The common message of the stories is that only a good character wins success in life. The stories include the ones narrated by Buddha to his disciples related to his previous lives. Although the stories basically are meant for the children yet the people of all age groups enjoy and learn from them. 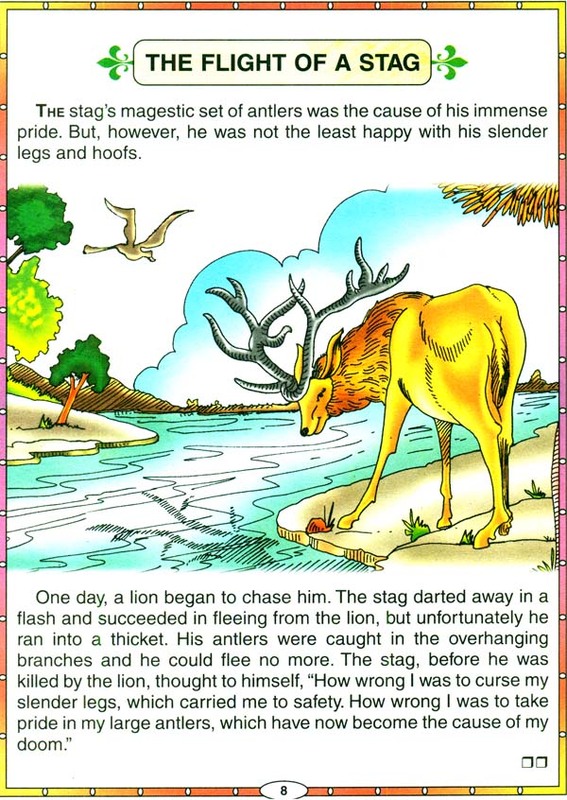 The coloured illustrations and simple narrative add to the joy of reading. The hunters chased the fox. To save her life she sneaked into the house of a wood cutter and hid under a cot. The wood cutter had seen the fox. A little while later the hunters arrived there. They asked the wood cutter about the fox. He denied having seen any fox but at the same time he gave them hint through eye signal about, where the fox lay hiding. The hunters failed to decipher the signal and went away. The fox came out of the hiding and began to depart from there. The wood cutter remarked to her, "You should thank me atleast". The fox stopped and turned back to say, ''What for should I thank you? For denying my presence here or for giving them a hint about where I was hiding?" The woodcutter had no answer. Such is the fate of the double faced persons. Morality is the base of the human character. Without it no personal, family or social system can be conceived. The morality is the essence of all the human values that separate us from the animals. These moral values are the common base of all religions. For ages the stories have been used as medium to teach those moral values. The character and symbolic figures of the stories fascinate the children and catch their imagination. The mind of a child naturally imbibes the messages contained in the stories. That is the success of these stories. In this age of cable culture the kids prefer cartoon movies to the serials. They like the concepts that have suspense, thrill, mischief, adventure and a bit of jingle music. These stories have all those factors in the worded format. The children grow a reading habit and inculcate moral values to form a happy future society, is our earnest wish. How to choose a Girl? Who is better: The Rose or the Amranth ?